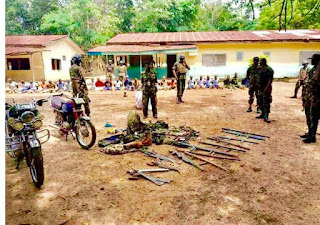 An entire fake military base was unravelled at Okpokwu, Benue State. According to Twitter user,@mustafaramalan the fake based was discovered on the 26th of September and the men parading themselves as soldiers were rounded up. Reports says that the suspects are specialize in breeding armed robbers, kidnappers and high profile criminals.